Hawai‘i Homegrown Food Network, the Breadfruit Institute of the National Tropical Botanical Garden and Amy B.H. 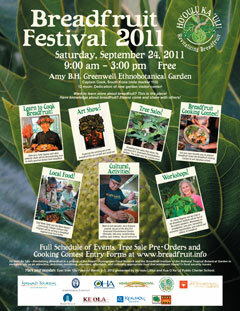 Greenwell Ethnobotanical Garden are presenting the Breadfruit Festival—Ho‘oulu ka ‘Ulu at the Amy B.H. Greenwell Ethnobotanical Garden in South Kona on Saturday, September 24, 2011 from 9:00 am – 3:00 pm. The Breadfruit Festival celebrates the rich culture of breadfruit (‘ulu) in Hawai‘i and the Pacific, raises awareness about the importance of breadfruit for food security and gives the people an opportunity to taste many delicious ways that breadfruit can be prepared. The Festival is free and open to the public. Read rules and instructions, and download entry forms. Contest entrants must submit an entry form with recipe(s). Check out the prizes! The Keauhou Beach Resort, Sheraton Keauhou Bay Resort & Spa and Sam Choy’s Kai Lanai will feature delicious 'ulu dishes on their menus. Plus, a special presentation at the Keauhou Farmers Market. This pdf poster is suitable for printing and showing to all your friends! The six-page program covers scheduling, site map, and background material. Directions to Amy B.H. Greenwell Ethnobotanical Garden, the festival location. Breadfruit-inspired food will highlight the festivities. Chefs Olelo pa‘a Faith Ogawa of Glow Hawaii and Scott Lutey, Executive Chef of the Eddie Aikau Restaurant and Museum will be demonstrating how to make various delicious breadfruit dishes and giving out samples to taste. A local food buffet featuring breadfruit will be presented by Chef Betty Saiki and the West Hawai‘i Community College Culinary Arts Program. Members of the public are invited to enter the Breadfruit Cooking Contest with their own favorite recipes. Open to all Hawai‘i Island residents, Cooking Contest prizes will be awarded in the categories of Appetizer, Soup/Salad/Side Dish, Main Dish/Entrée, Dessert, Best of Show and Healthiest Choice. Celebrity Chefs Mark Tsuchiyama of Hualalai Resort, Jacqueline Lau of Roy's Restaurants, and Olelo pa‘a Faith Ogawa will be joined by food writer Sonia R. Martinez and KITV weekend anchor Pamela Young to judge the Cooking Contest. The Breadfruit Festival will feature many Hawaiian and Pacific Islander cultural activities, including: Mahi‘ai and educator Jerry Konanui will lead a hands-on workshop in the art of preparing ‘ulu poi. Hawaiian cultural expert Wesley Sen will be demonstrating how to make tapa from ‘ulu bark. ‘Ohana of the late Micronesian navigator Mau Piailug will share ‘ulu preparation techniques from their home island of Satawal. Master artisan Keoni Turalde will be carving a Hawaiian pahu (drum) from ‘ulu wood. Cultural experts Ryan McCormack of Kua O Ka Lā Public Charter School and others will be giving talks on the culture, history and mythology of ‘ulu in Hawai‘i. Other cultural activities include ‘ulumaika, lei making, and quilting featuring ‘ulu motifs. Workshops on breadfruit propagation, tree care and maintenance, economic opportunities and other topics will be given by experts Dr. Diane Ragone and Ian Cole of the Breadfruit Institute. An art exhibit will feature breadfruit-inspired works from the Festival fine art and youth art contests. ‘Ma‘afala’ (Samoan) and Hawaiian varieties of breadfruit trees will be available for sale. In the week leading up to the Breadfruit Festival, the Keauhou Resort will celebrate the "Taste of 'Ulu" by featuring gourmet dishes in its resort restaurants and at the Keauhou Farmers Market. The Breadfruit Festival is sponsored by the Hawai‘i Tourism Authority’s Kūkulu Ola—Living Hawaiian Culture Program. Other sponsors include Kamehameha Schools, Office of Hawaiian Affairs, Keauhou Resort, Ke Ola Magazine, Ho‘oulu Lāhui, Kua O Ka Lā Public Charter School, West Hawai‘i Community College Culinary Arts Program, Big Island Resource Conservation and Development, Glow Hawai‘i, Kona ‘Ulu, Hawai‘i Tropical Fruit Growers, Sonia R. Martinez, ‘Āpono Hawai‘i and dozens of individual “Breadfruit—Traditional Roots and Modern Fruits” campaign supporters. Learn more about the Breadfruit Festival by visiting www.breadfruit.info.